Jackie Chan finally given Oscar after more than 200 films and a lot of broken bones. At 62, one could say that the actor is as agile as he was when he first entered the industry 56 years ago. 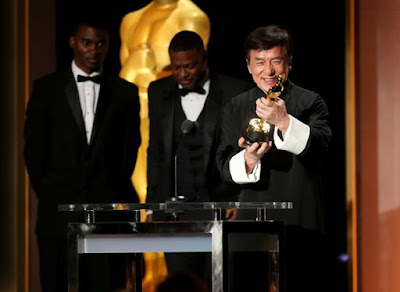 200 films and several broken bones later, he has finally won an Honorary Oscar at the eighth Annual Governors Awards for his decade’s long contribution to international cinema. "After 56 years in the film industry, making more than 200 films, after so many bones, finally..." the actor said. 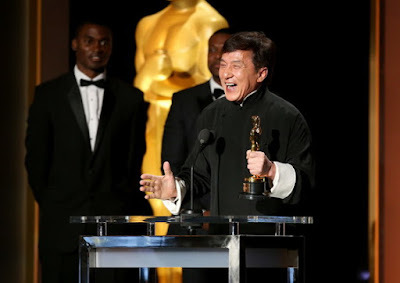 Chan had dreamed of receiving an Oscar from the time he saw one sitting insolently on Sylvester Stallone’s shelf 23 years ago, according to E News. “I touched it, kissed it, smelled it. I believe it still has my fingerprints on it…Then I talked to myself, ‘I really want one’,” declared an exuberant Chan.